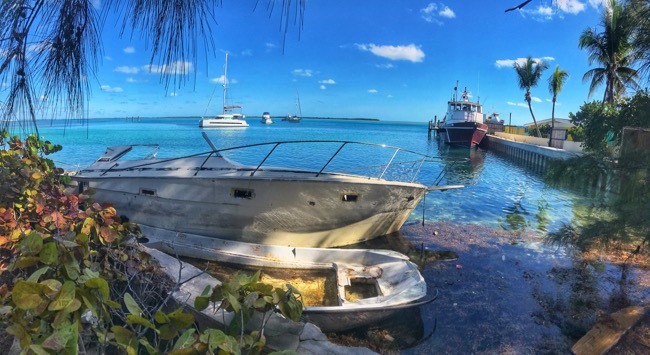 We arrived at Bimini elated but also exhausted. We were both almost in disbelief that our calculations of current through the Gulf Stream had led us exactly to our anticipated destination. We had read so many blogs about people who got through the stream only to find themselves well north or well south of their destination (having under or overshot it) and with a few hours of motoring remaining at the end of their day. We were both surprised and thrilled that wasn’t the case for our arrival. It had been a faster day than we anticipated by a few hours, meaning we had plenty of daylight left to burn (also a surprise since we sailed most of the day and were concerned about not making it before sunset). We were giddy with excitement, so very proud of ourselves and each other for making it here, but we also were well aware that the adrenaline rush of leaving in darkness and the onslaught of waves for most of the morning had clearly taken its toll. We approached the channel, started turning into irons to drop our sails before entering and got hailed on the VHF. We looked up and a huge barge was exiting the channel (and wasn’t on our AIS). They were tuning directly towards us so we turned the boat to fade away. In our rush we didn’t really think through how fast we turned or which direction and the sail slammed quickly from one side to the other and ripped one of the lines of our lazy jack before the turn was complete. And there goes our perfectly executed day. We raised our yellow quarantine flag (somehow a momentous event) motored into the channel, paused in front of the customs house and hailed them asking if we could dock. No response. We hailed again a few more times. Nothing. It is a Saturday but we didn’t think they’d be closed based upon our research. We continued onward looking for a place to anchor in proximity to the customs house in case they just weren’t responding but also close enough we could check in early Monday if need be. Just after the marinas we found a small sandy spot with only one other boat. We are still pretty uncertain of our own anchoring skills, so we tried to give them a bit of room and anchor just on the cusp of the channel. We lined up, dropped anchor and waited. Nothing. That’s the first time our anchor hadn’t caught. We pulled forward, retrieved our anchor, made certain we were just over another sandy spot and dropped again. Nothing. We had read a lot about how much of the Bahamas has a thin layer of sand over rock that either won’t hold you (or worse, will fake that its going to and then fail later under wind or tidal changes…usually in the middle of the night when you aren’t watching) but in this case it seems our anchor was actually falling off toward the deep channel. We went to retrieve our anchor again and saw the captain of the single boat circling. We immediately assumed we were too close and he was going to run us off but he instead shouted for us to try the spot inside of him towards land. We looked to the other side of his boat and thought he was crazy. There was an uncomfortably small section of sand between his boat and the rocky shore. “Im not so sure” I said to jen, but we went in an checked it out. Didn’t help the confidence that a shambled wreck of a sailboat was still lying on the shore as a visual clue to what could happen if an anchor doesn’t hold. We looked for a bit, heard the other captain yell that he’d be right back and then dropped anchor and surprisingly got a good hold. We felt great about the grab, but still uncomfortable with how close we were both to the other boat and to shore. We held out, looking around, staring at the anchor and unsure what to do and started making a plan to leave and look further away, but before we had a chance to pull the anchor the captain came back and pulled alongside our boat and tying off to ours without a second thought. 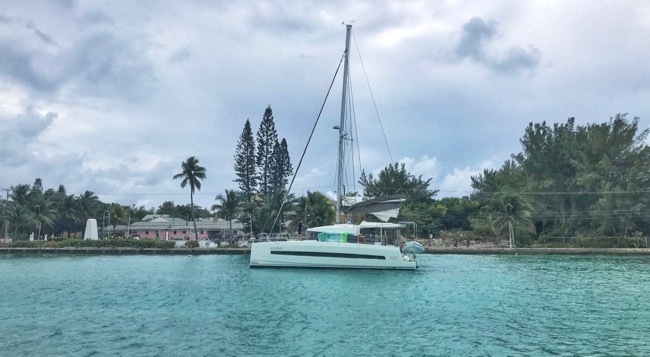 He came aboard, we made introductions and within minutes was not only convincing us to stay but giving us instructions on everything from our VHF to how to drop a second anchor “Bahamas style” (so we wouldn’t swing either into him or into the shore if the winds changed). He was very unhappy that we had only rope for our second anchor, so he ran us over to his boat to grab some extra chain (and a few other items he insisted we simplymust have) and then helped give us a lesson in dropping a second anchor. He refused to take no for an answer and took us ashore to show Jen the way to customs (only the captain is technically aloud to leave the boat until you’re fully checked in, so as captain this lies clearly in Jen’s roles), then tried to find us a place to buy a cell card, but really just ended up giving us a little tour of Bimini on the back of some stranger’s golf cart that he flagged down for a free ride. Back at the boat we heard a few more stories, a few involving how many people he has literally pulled out of the sea and off wrecks during storms, and then as we tried to tell him we were tired he insisted we get to work (under his guidance) at fixing our broken lazy jacks. “Safety issue, has to happen right now” he kept saying. This guy is either the nicest and most helpful person ever, or just really wants us to make him another drink I thought to myself, but we went about the work of hoisting me up the mast (our first time) to fix the lines. In hindsight it was probably a bit of both, the helpfulness and the drink. Suddenly we were bonding on a much deeper level and seeing an entirely different side of Captain Steve. He had been nothing but helpful throughout, but this salty sailor was also showing us a softer side. While he has sailed for decades on both cats and monohulls he also had been running the family business up until a month or so ago. That’s when he quit the business, sold or given everything away, moved onto his boat full time and took off for the bahamas. Our kind of guy! Turns out his “change event” was simply someone showing him a video about time (and the lack of it). He told us how someone showed him the video and within minutes he had fired everyone, locked the doors and walked away from it all. The story originally seemed a bit too extreme to be true, but about 20seconds into showing us this video Steve broke into tears and was overcome with emotion. I have no doubt this guys story is completely true, and while im certain there are large portions we don’t know- im thrilled to meet someone who truly gets it. Who isn’t willing to waste another second doing something that doesn’t light them up and chasing freedom and happiness immediately rather than waiting for a “someday” that might never come. We spent the next few days touring the island with Captain Steve. learning more about the boat than we had in the previous month and with him taking us out on one of his 3 dinghies/motorboats under tow (he has a self professed obsession). It was amazingly fun and we clearly got the locals version of Bimini even if he isn’t technically a local (but he has been coming for at least a few weeks a year for the last 20years). We went out in search of conch (while being towed on a few ropes behind his boat), we snorkeled a cool local wreck that had an amazing display of fish and anchored/walked up to a beach bar run by “Coconut Brian” which really turned out to be little more than a table in the sand with a few bottles of run, coconuts and blender. I can’t tell you how much we needed this! A few days where we almost couldn’t focus on projects and had to relax and enjoy our surroundings, much less with someone who knew the island so well. In hindsight, we would have likely just waited out customs until Monday (not even knowing they were open the whole time), never explored the island and then simply moved on. Instead, we got a true experience of the Bahamas and settled quickly in to our immediate future.